Visiting an old people's home, I walked down a corridor on the floor given over to advanced Alzheimer's parents. Some seemed anxious. Some were angry. Some simply sat there. Knowing nothing of what was happening in their minds, I wondered if the anxious and angry ones had some notion of who they were and that something was wrong. I was reminded of the passive ones while watching "Eternal Sunshine of the Spotless Mind." Wiped free of memory, they exist always in the moment, which they accept because it is everything. This passage comes well into a very long poem which I doubt the character Mary would have memorized. The audience needn't know that; many may know no more than she does when she calls the author Pope Alexander. She quotes as she's trying to impress a boss she loves. Kaufman has that knack of painlessly explaining his subject right there on the screen. Consider how much information about evolution he embeds in his screenplay for "Adaptation." Kaufman, the most gifted screenwriter of the 2000s, is concerned above all about the processes of thought and memory. His screenplay for Spike Jonze's "Being John Malkovich" (1999) involved a way to spend 15 minutes inside the mind of another person. Michel Gondry's "Human Nature" (2001) is concerned about the Nature vs. Nurture theories of our behavior: Do we start this way, or do we learn it? Jonze's "Adaptation" (2002) contrasts the physical evolution of orchids (which assume fantastic forms to earn a living) with identical twins, one who writes from his nature and the other from his nurture. In George Clooney's "Confessions of a Dangerous Mind" (2002), he shows the game show creator Chuck Barris leading a double life as a deadly CIA assassin (Barris believes this story is factual). Kaufman's first film as a director, "Synecdoche, New York" (2008), is his most challenging. He attempts no less than to dramatize the ways in which our minds cope with our various personas and try to organize aspects of our experience into separate compartments we can control. These sound like topics for a class in evolution or neuroscience, but Kaufman and his directors structure them like films that proceed quite clearly along paths we seem to be following, until we arrive at the limits of identity. "Eternal Sunshine of the Spotless Mind," like "Malkovich," invents a fantastic device for its peculiarities, and wisely declines to explain it. All we know is that an obscure company in Boston offers to erase your memories of a particular person or anything else. Period. The film opens like a Meet Cute. Indeed, it's a film built around Meet Cutes, some not so Cute. A solemn, worried man named Joel (Jim Carrey) takes a train for no reason and at a station encounters Clementine (Kate Winslet), who thinks they've met before. He doesn't think so. She persists. He goes home with her and they sleep together. In fact they have met before and were in love, but it ended badly and they both had the memory erased. That much is quite clear. It also becomes clear, later, that when the wounded Joel discovered what Clementine did, in revenge he sought to wipe her from his memories. His head is encased in a sort of aluminum football helmet attached to an alarmingly small laptop controlled by a technician named Stan (Mark Ruffalo), who drinks beer with his co-worker Mary (Kirsten Dunst). They're jumping on his bed in their underwear when Joel's mind goes "off the map." Terrified, Stan calls in the boss, Dr. Mierzwiak (Tom Wilkinson), who is alarmed, as well he might be. Inside the helmet, Joel struggles desperately to resist the loss of his memories of Clementine. He has literally changed his mind about changing his mind. Kaufman by now has jumped the rails and tumbled us into a labyrinth of time and reality. We see Joel and Clementine at various times before both erasures, after hers, and during his--when he even tries to hide his memories by disguising them both as childhood playmates. Some viewers have been confused by the film's movement through chronology and locations, but I think the paradoxes are explained if we realize that everything is happening in only one place, Joel's mind. The disconnects are explained by his fragmented memories of when that they were together before, during and after the erasure. The train station sequence at the beginning is closer to the end of the movie's timeline. Not that we're required to piece it all together. Gombry and Kaufman use qualities of the cinema itself to allow it to make emotional sense when it's baffling any other way. We know our minds easily comprehend and accept flashbacks, hallucinations and conflicting realities. Even small children seeing a flashback for the first time understand what's being conveyed. As impossible events occur, we understand they're subjective--generated in the minds of the beholders. That explains the crumbling beach house in "Eternal Sunshine" and the constantly burning home in "Synecdoche." We know at the time they aren't "real," and afterwards we're missing the point if we ask for an "explanation." These films are made with insight into how the mind translates information. Kaufman isn't merely an ingenious screenwriter but a shrewd one. Notice how he uses the comic subplot involving Joel, Catherine and Patrick (Elijah Wood), the clueless office assistant, as counterpoint to his fraught central story. And how Dr. Mierzwiak functions as the Prospero figure, lending gravitas to an absurd premise. If we complain about these "extra characters," we may as well complain about their parallels in Shakespeare. It's difficult to focus on two people in an impossible situation for three acts, and even harder to make that entertaining, as a film like this must. Kaufman uses comic relief as a important device in his construction. His screenplays require actors who can keep a straight face in the center of farce. Nothing is more fatal than an actor signaling that material is funny. That's for us to decide. To the character, it's his life, and there's nothing funny about it. Keaton never allowed himself a smile or a wink; Chaplin a few smiles, but too many. Jim Carrey in "Eternal Sunshine" is a sad sack throughout; John Cusack in "Malkovich" earnestly desires to do good, and Malkovich himself has made a career of probity; Philip Seymour Hoffman in "Synecdoche" desperately seeks to hold together his mental machinery (and the film itself is far from funny). Why I respond so intensely to this material must involve my obsession with who we are and who we think we are. The secret of communicating with another person, I suspect, may be in communicating with who he thinks he is. Do that, and you can kid a great man and treat an insignificant one with deep respect. They'll credit you with insight. 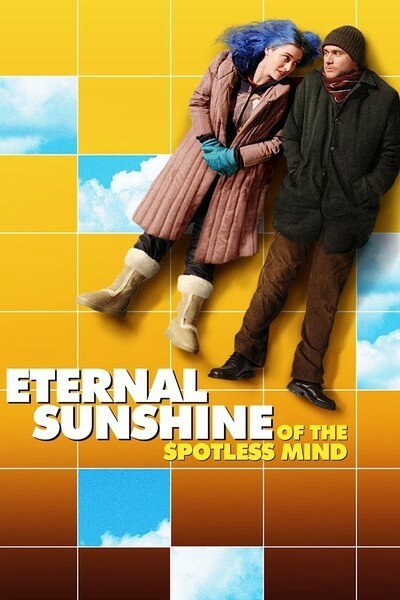 The wisdom in "Eternal Sunshine" is how it illuminates the way memory interacts with love. We more readily recall pleasure than pain. From the hospital I remember laughing nurses and not sleepless nights. A drunk remembers the good times better than the hangovers. A failed political candidate remembers the applause. An unsuccessful romantic lover remembers the times when it worked. What Joel and Clementine cling to are those perfect moments when lives seem blessed by heaven, and sunshine will fall upon it forever. I hope those are the moments some of those patients are frozen in. They seem at peace.